Most everyone has experienced a headache at least once. According to the National Institute of Neurological Disorders and Stroke, at least 9 in every 10 adults will experience a headache sometime in their life. 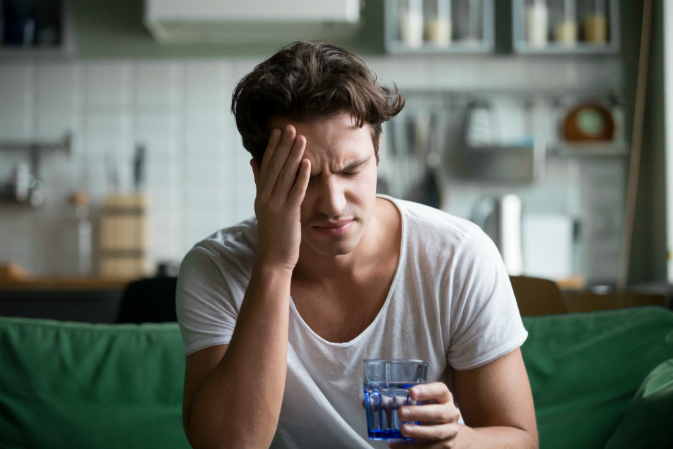 While there are many different types of headaches, each with their own probable causes and methods of prevention or treatment, one type that hasn’t been explored thoroughly is dehydration headaches. Many people acknowledge that after a night of heavy drinking, dehydration is a major cause of a hangover headache. However, you can also get dehydration headaches when you haven’t been drinking. Throughout the day, the body loses fluids and electrolytes, whether by urinating or sweating. This means you need to keep up your fluid amounts by drinking water or eating hydrating foods. When the body becomes dehydrated, the brain shrinks away from the skull, triggering pain receptors in the meninges (membrane surrounding the brain), thus causing dehydration headaches, otherwise known as water deprivation headaches. Even mild dehydration can cause these headaches. Again, since dehydration headaches occur when the body is dehydrated, treating the issue would include treatment of the headaches. One suggestion would be to increase fluid intake using water and/or drinks high in electrolytes. Temporarily reducing physical activity and staying cool to lessen sweating may also help. The general rule for drinking water is four-to-six cups daily, but there is no one-size-fits-all rule. Everybody is different so each body may require different amounts of water, especially for those with certain health conditions. If dehydration headaches are a chronic issue for you, Healthpointe’s Headache Clinic has doctors that can help. Schedule an appointment with a doctor today.